I stated that “one man’s garbage, another woman’s treasure”. ???? 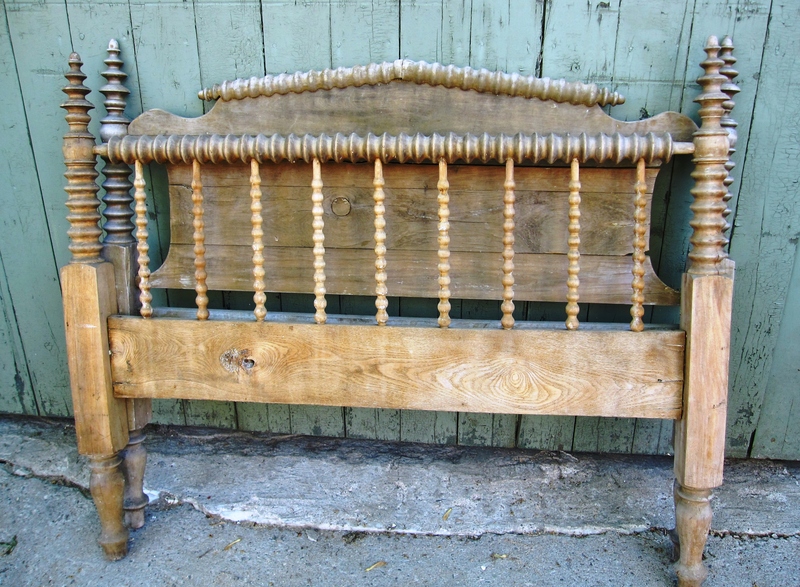 Well……after a bunch of (my hubby’s) elbow grease, this old spool bed that was left for garbage at the side of the road is now my cottage bedroom treasure. Nothing short of totally dismantling, re-gluing, sanding, staining and altering to fit a bigger mattress the spool bed’s makeover is now complete. Sweet dreams! This entry was posted in Home and tagged DECOR, diy, furniture, Interior Design, style by Modmissy. Bookmark the permalink. Best thing to do is to pull that iron bed frame out of the garage and start staring at it! Kidding. But I know that with me out of sight out of mind. (I think my hubby puts things away hoping I forget so I don’t bug him!!!) Could try Google to see how to adapt the bed frame to attach it to your daughters bed base? Good luck and let me know if you have any success. Thanks Corinna. Congrats on being a Speaker at Blogpodium. Haven’t yet decided if I will attend. $$$ But it looks like it will be a fabulous event.